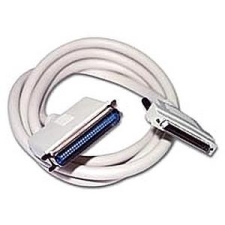 Ultra SCSI (or SCSI-1), is the latest of the ever improving SCSI standards, and is the cable of choice for such peripherals as the Iomega Zip Drive. It includes specifications for a single-ended as well as a differential bus style. The single-ended is similar to Fast SCSI-2, except it accommodates addressing up to 32 devices over a 16 bit single cable bus. This new style also increases data through-put up to 20 Mbps in single-ended applications. Single-ended SCSI-1 is limited to 4 devices over 3 meters or 8 devices over 1.5 meters. Differential SCSI refers to a bus configuration using two wires per signal, with the signal being derived by the voltage difference between the two wires. This approach effectively eliminates noise on the SCSI bus and allows bus length to increase up to 25 meters. If you need cables for differential Ultra SCSI applications, please call for help since they require different construction techniques.